Come see this VDO clip of Geminoid DK*, there was the moment I wasn’t sure myself if he was real human or just humanoid. Since the beginning of the history of android studies, there’s never come yet the day that human-like robot can be really like a person. The problem, firstly and clearly seen, is on the appearance. They don’t look biological. The later problematic point is the humanoid’s gesticulation as you can imagine how mechanical they move. These two factors jumble together only to bring the real world of zombie comes true. However, Professor Hiroshi Ishiguro made a very good progress in developing his humanoids. He created his geminoid which is his twin-alike in 2006 and named it Geminoid HI-1. This one was still obviously not so real as a person. Then in 2010, he brought Geminoid F to the human world. Geminoid F was a cute girl, not frightening anymore. It was real cute that so many people and media wanted to know its template model (Professor Hiroshi confirmed to keep this information confidential.) Geminoid F looked pretty and looked as capable as to become an actress. And yes, it has really become one. 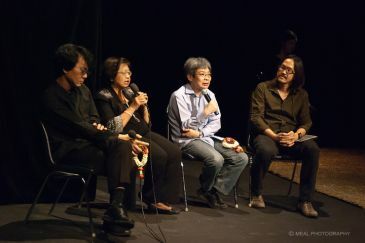 Geminoid F had just come to have its premiere stage play, Sayonara**, outside Japan in Bangkok, Thailand last March. On the stage, Geminoid F blinks its eyes naturally, smiles beautifully. It also twitches and really it can breathe. The researcher team wrote software to simulate involuntary movements like breathing and twitching, together with embedding air servo valves and an air servo control system into its body. So, things could be expected to go smoothly with a human operator provided voice and controlled Geminoid F’s physical movement from backstage by microphone and cameras that tracked head and face. Geminoid F would mimic the operator’s every movement, however, only every movement of the head. Geminoid F couldn’t move the body yet. Actually, its voice didn’t sound convincing that it was generated by the geminoid either, and its fidgeting also looked rather like convulsive jerking. 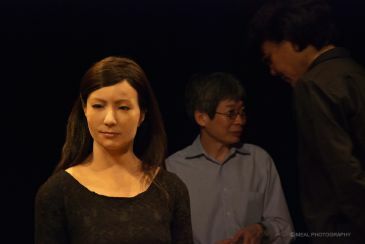 Professor Hiroshi’s humanoid as an actress was finally found too deceiving to be a human. Anyway, the role Geminoid F took on the stage was an android companion to a sick girl, thus there was nothing to be blamed in the end. Anyhow, the bottom line of the Geminoid Family’s story isn’t about the play, it’s about Professor Hiroshi’s concept of human-robot interaction. His work pursues the path that will bring the feeling of one’s presence to the robots - we’re talking about the atmosphere or authority of a person here. He envisioned the future that robots would not only do chores, assist physicians, pick up bombs; but also teach classes, care for the elderly, attend the meeting, serve as a cell phone, or simply speaking, the future that robots can replace someone’s presence. Professor Hiroshi Ishiguro is the director of the Intelligent Robotics Laboratory at the Department of System Innovation, Faculty of Engineering Science, Osaka University, Japan.